It was a busy month for the pharma giant. Here's a look at the key developments that caused its share price to rally. According to data from S&P Global Market Intelligence, shares of Pfizer (NYSE:PFE) gained 7.7% in February. The move has added more than $11 billion to the pharma giant's market capitalization. Top-line results from a study comparing its rheumatoid arthritis drug Xeljanz to AbbVie's Humira showed that Xeljanz in combination with methotrexate met its primary endpoint in demonstrating non-inferiority versus Humira in combination with methotrexate. Pfizer and partner Celltrion Healthcare presented data at the annual Congress of the European Crohn's and Colitis Organisation. The data showed that Inflectra -- Pfizer's biosimilar version of Johnson & Johnson's megablockbuster drug Remicade -- showed similar efficacy and safety in treating Crohn's disease when compared to Remicade. Its FDA Biologics License Application, or BLA, for inotuzumab ozogamicin has been accepted for review. This drug has been granted Priority Review by the agency as a treatment for relapsed or refractory B-cell precursor acute lymphoblastic leukemia. A decision date is expected by August 2017. According to Pfizer and partner EMD Serono, a second BLA has been accepted by the FDA for Priority Review of avelumab as a hopeful treatment for urothelial carcinoma. A decision is also expected in August of this year. 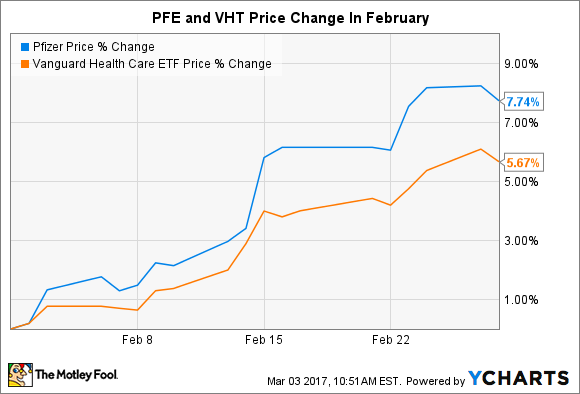 When you add this string of positive developments to the general rise in the healthcare sector -- as measured by the Vanguard Health Care ETF -- it is easy to understand why shares rallied in February. Pfizer's management team is projecting that 2017 will be another year of growth. Revenue is expected to land between $52 billion and $54 billion while adjusted earnings per share is forecasted to fall in the range of $2.50 to $2.60. While the midpoint of this range represents a small bump from the $52.8 billion in revenue and $2.40 in adjusted profits recorded in 2016, it's growth nonetheless. It's also worth pointing out that this forecast reflects the upcoming disposition of its Hospira Infusion Systems business and a negative hit from currencies. Absent these charges, the growth rates would be quite a bit higher. All in all, Pfizer continues to look well positioned to post modest EPS growth in the years ahead. With shares trading for less than 14 times full-year earnings estimates and offering up a dividend yield of 3.7%, Pfizer remains a solid choice for healthcare investors who eschew risk.